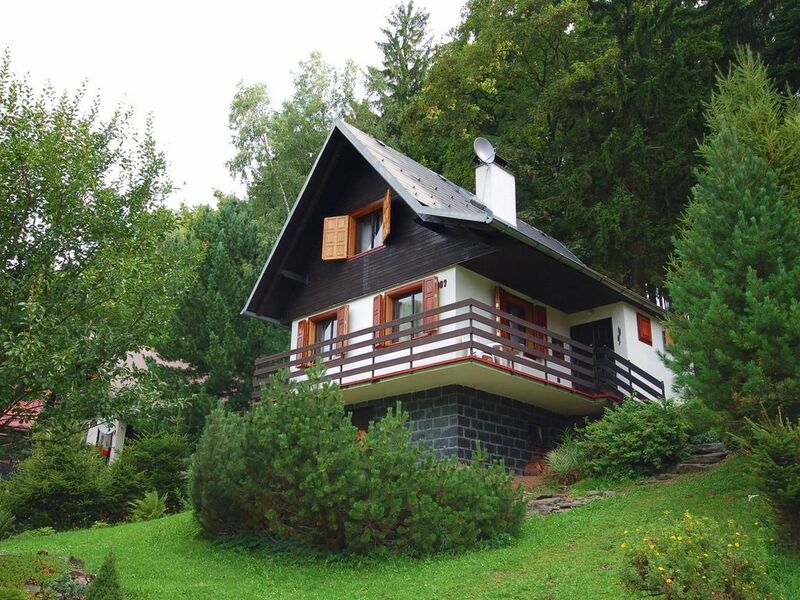 Your vacation object: The holiday house is placed on a 40 sqm and an open property with meadow and bushes. Fees for additional services on the spot are only indicated approximately CZK has to be paid in currency spot. The landlord does not live in the house or on the property. The facilities are at your disposal for exclusive use. Relax outdoor at the terrace with garden furniture. Barbecue possibilities are available. The campfire place promises romantic evenings. Vacuum cleaner. Your holiday house: Your holiday house consists of 2 floors, 3 rooms (from which 2 bedrooms), is 68 sqm and can accommodate up to 5 persons. Smoking is not permitted inside the rooms. On colder days your holiday house can be heated with electric heating. Hearth (wood / coal) in the living room. Electric heating in the bedroom. The entrance leads over 6 steps and an external stair. The rooms are divided as follows:Ground floor: Living room with fireplace, lounge and TV. Kitchenette with electric cooker (4 plates), oven, refrigerator (50 l, freezer), microwave, coffee machine and electric water boiler. Bathroom with shower, 1 washbasin and electric boiler - 80 l. Separate WC with WC.1st floor: Bedroom with 2 single beds. Bedroom with 1 double bed and 1 single bed. In addition, your holiday house is equipped with baby bed. TV or radio channel can be received only in national language per antenna. Classic TV. Pets: nicht erlaubt. Ground floor: bathroom with shower, 1 washbasin and electric boiler - 80 l. separate WC with WC.